A plan centred around showing women respect. "Efforts on gender equality are very timely," said Shin Eun-kyung, an economist with the Organisation for Economic Co-operation and Development. 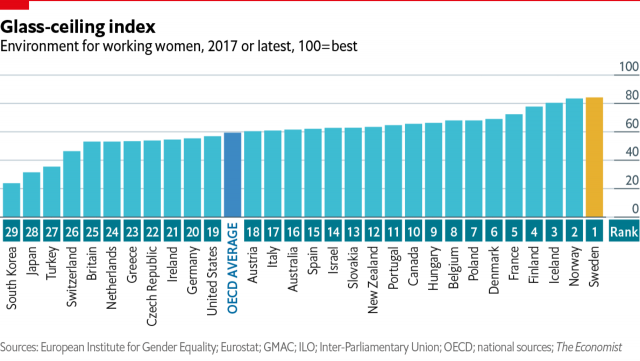 South Korea is the worst place for women to work in the OECD, despite women being among the organisation's best educated, and more highly so than men. "The country sees women as baby factories," says Hong Sook-young, who produces the country's most popular children TV show. Asked about the latest measures, Hong said "at least pretending to hear what people really want is a start towards change". Birth rates have long been a policy priority: since 2006, the government has spent 152.9 trillion won ($135.65 billion) - about the size of an economy like Hungary or Nevada - on perks for families and subsidies for children from birth through university and beyond. Last year's 26.3 trillion low birth policy budget was more than half the defence spending of a country technically still at war with its northern neighbour. The government went far beyond child allowances and subsidising care and education. For instance, it funded temple stays for family bonding and financed youth seeking brief jobs abroad. Many such programmes will end, with the 2019 birth-support budget cut by a quarter, to 20.5 trillion won. While Samsung Electronics has a more balanced gender ratio than Apple globally, with women accounting for 45 percent of the staff versus a third at its U.S. rival, only one in four staff at its Korea headquarters are women. None of the nine board members at Hyundai Motor Co are women, versus six out of 12 at General Motors. A Hyundai Motor spokeswoman said the firm was committed to providing equal opportunities to all employees and opposes discrimination. A Samsung Electronics spokeswoman said the company has been recruiting more females, including in managerial positions, and that most staff return to work after parental leave and its daycare centres can look after 3,000 children. Q&A: How is South Korea closing the gender gap? Ryu Won-woo, manager of baby fair organiser BeFe, praised the government's measures, especially those encouraging more responsibilities for dads. But he does not expect quick results.